Welcome to my weekly series: Book Club Picks. This week, I'm sharing some selections from one of my favorite genres: mysteries and thrillers. One concern with some books in this genre is that you need to be sure everyone in your book club is okay with some violence and suspense. For some book clubs, cozy mysteries may be okay, but the books I'm recommending are a bit more intense and often include descriptions of violence. If you don't think your entire book club would like these, perhaps you would like to read one on your own! If you haven't seen the movie yet, this is an amazing book that will keep everyone talking. The characters are so incredibly flawed that discussing them and their actions alone will take up half the night. Book clubs can also talk about the way the book was written from different perspectives, and the way the author created twists and turns that most people didn't see coming. The ending will likely prompt a heated discussion as well. My book club discussed this novel back when it came out and it was a good discussion. The story is disturbing and will prompt a lot of talk about what you would do in this situation, and the choices the main character makes. The author's choice to tell the story from the child's perspective provides another topic for conversation. This novel takes us into the world of a bunch of teenage girls at a boarding school, and the investigation into a murder that happened a year ago at the school. Book clubs can talk about the way the book is written in alternating chapters between present day and the time before the murder. There's also plenty to talk about with regard to the actions and attitudes of the girls at the school and the surprises along the way. This is the one nonfiction book on my list, but it does not read like a nonfiction book. It reads like a a great mystery novel. Book clubs can talk about this writing style and also about the amazing effort that went into the Chicago World's Fair, and the impact it had on our modern world. But what gets it onto my list is the portion of the book that details a serial killer's horrifying actions in that time and place. This is a fairly new release, and I haven't managed to write my review yet (I'll update this when it's up) but I couldn't leave it off the list. This is one of those books where the reader is left wondering what is going on for most of the story. Book clubs can talk about the complex characters, none of whom seem very trustworthy, and the relationships they have with one another. They can also talk about how the author uses different voices throughout to tell different aspects of the story, without giving too much away. What are your favorite mysteries and thrillers? Do you have any that you'd recommend for book clubs to discuss? Next week, I'll be sharing some great online resources for book clubs. Please let me know if you have suggestions for other topics to cover, or if you would like to write a guest post for my Book Club Picks series. I'd love to hear about your book club or your favorite books for discussion! I have stopped by on the right day. I've read and enjoyed all these except Devil in the White City - haven't read that yet. The Secret Place wasn't my favorite Tana French but I'm a huge fan of her work! 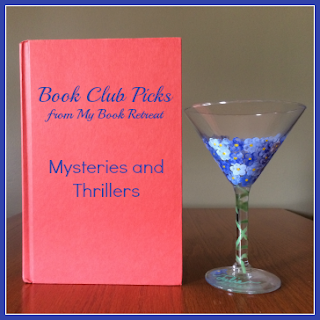 I would love for my book club to read more mysteries. The Human Bobby was a great choice for us, great discussion.